Provide comfort for the family of Sr. Elaine Robbins with a meaningful gesture of sympathy. 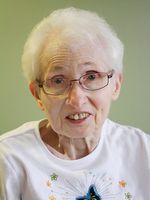 Sister Elaine Robbins, OP, died Friday, April 5, 2019, at St. Dominic Villa. Her Mass of Christian Burial will be at the Sinsinawa Motherhouse, April 13, 2019, at 10:30 a.m. Her wake will be 6:30 p.m., April 12, 2019. Casey Funeral Home & Cremation Services of Cuba City is handling arrangements. Sister Elaine was born on July 23, 1932, in West Allis, Wisconsin, to Joseph and Viola (Miller) Robbins. She taught at Visitation, Chicago; Annunciation, Minneapolis; St. John, Milwaukee; St. Thomas, Palatine, Illinois, Most Pure Heart of Mary, Mobile, Alabama; Father Benedict Justice, Kansas City, Missouri; and St. Rose of Lima, Baltimore, Maryland. During the 1980s, she was DRE at Holy Family/St. Patrick Parish, Apalachicola, Florida, and Our Lady, Matlacha, Florida. In the 1990s she ministered in Diocesan Black Evangelization in Fort Myers, Florida, and tutored at Martin House, Apalachicola, Florida, before returning to Sinsinawa in 2007. She came to St. Dominic Villa in 2014. To send flowers in memory of Sr. Elaine J. Robbins, please visit our Heartfelt Sympathies Store. Visitation will be 6:30 p.m. Friday, April 12, 2019. We encourage you to share your most beloved memories of Sr. Elaine here, so that the family and other loved ones can always see it. You can upload cherished photographs, or share your favorite stories, and can even comment on those shared by others.